KEY QUESTIONS: What makes us belong to a group? What stops us belonging? How do we include others? 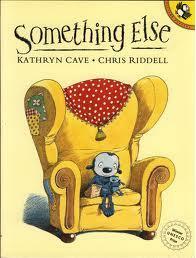 The picture book Something Else by Kathryn Cave with Chris Riddell illustrations, tells the story of a ‘creature’ who is told he is ‘not like us’. It explores fitting in and how we cope with not fitting in, as well as how we can be friends to someone who is being excluded. ‘This book wrote itself in my head as I was listening to my 7-year-old daughter on our walk to school. Grown-ups can easily dismiss what goes on in the playground as unimportant, but of course it isn’t. It helps shape the way we grow up and relate to others. Not belonging is a painful experience at any age. But there’s a hopeful ending.’ Kathryn Cave, author. Can you find any similarities between Something Else and Something? Why does he tell the new creature to leave? Why does he change his mind? 2. After reading and discussing, explain that you are going to do an activity based on the differences and similarities in the story. You could use other activities available here such as Change Places, Visible and Invisible Differences, or Strand by me, but a good one for KS1 might be to move around the room and then move to a part of the room if you have a brother, if you have brown hair, etc. Then bring learners back together and discuss how there were some times when they were similar to each other, and some when different. Link to the story, and ask whether Something Else is similar to his friends at school, and then the new creature, and then finally the boy at the end. 3. Discuss why they might treat Something Else differently. What things about us might be weird to some people? The food we eat? Games we play? How we look? If the teacher can give any personal insights or examples here of when they felt really different to everyone else, and how they coped, that will help. NOTE: The SEAL and the Global Dimension website developed by Development Education Centre South Yorkshire (DECSY) has a number of resources on this topic area, including a story and accompanying activities called Kid Other, which explore the different roles and feelings involved in leaving someone out, and bullying them. In order to use these resources, and others on the site, you need to register but it is free. See the web tab right to visit this site. This book can be used as excellent preparation for KS2 about welcoming those we don’t know in preparation for a linking programme, and as part of your school’s work to promote spiritual, moral, social and cultural (SMSC) development. Learning Objectives: How to make someone feel welcome and valued. Explain how people may feel when they are not welcomed. Something Else Lesson Powerpoint – two activities exploring the key question ‘How Do We All Live Together?’ inspired by our resources Being New and Something Else. Something Else Activity 2 – What Should Something Else Do?